This colorful casserole is loaded with sweet, juicy cherry tomatoes and a variety of fresh herbs. On most local markets and in organic food stores you can find a great variety of cherry tomatoes. I used for this recipe yellow gooseberry, Blondkopfchen, black cherry tomatoes, camp joy and green zebra. The black cherry tomatoes are a bit smokier in taste, the Blondkopfchen have a delightful citrus finish and the yellow gooseberries are irresistibly sweet. 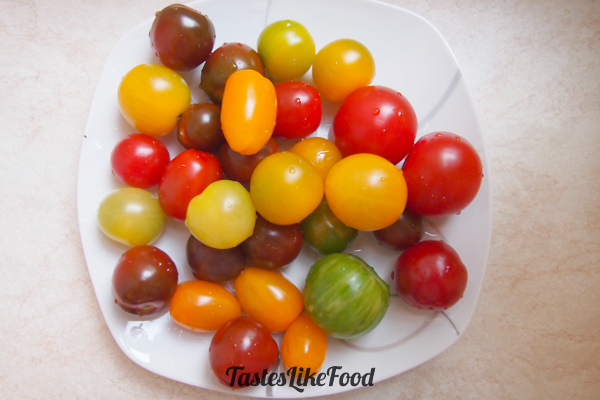 You can find out more about different types of cherry tomatoes. Although this dish is filling, it is perfect for hot summer days – it is not too heavy but instead full of the freshness that comes from juicy tomatoes and aromatic herbs. The aromatic beef is coated with crunchy Mozzarella and Parmesan cheese which make the perfect finish for this brilliant- simple and luscious casserole. Heat 2 Tbsp of olive oil on a frying pan. Add garlic, dry basil, cumin and red pepper. Fry for 1 minute until all the spices release their aroma. Add ground beef and continue frying until the meat turns brown. Add salt and ground black pepper. Set aside. Cook fusilli in slightly salty water until almost al-dente. Do not over-boil it, because the pasta will be baked later in the oven. In the meantime prepare the tomato sauce. In a medium saucepan heat 1 Tbsp of olive oil. Add 1 clove of grated garlic and fry it for 1 minute. Pour the red wine into the saucepan, add the tomato paste and cook for 1-2 minutes. Add the tomato pulp and grated Parmesan, and continue cooking for 10 minutes until the cheese melts and the tomato sauce becomes more dense. 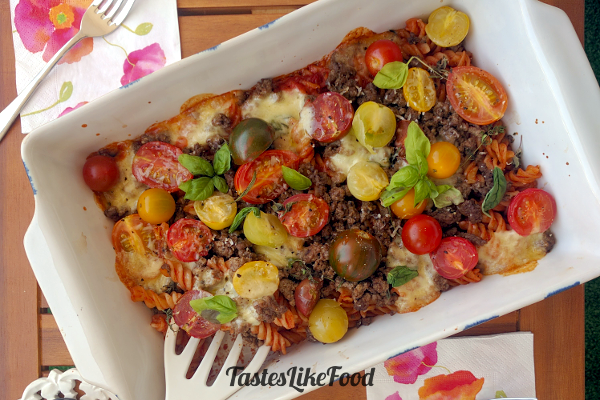 Combine the fusilli with the tomato sauce and spread it evenly in a casserole. On top of the pasta spread the minced beef. Leave 3-4 tomatoes aside. The rest slice in halves. Shred the Mozzarella into 3cm pieces and chop finely all the herbs. 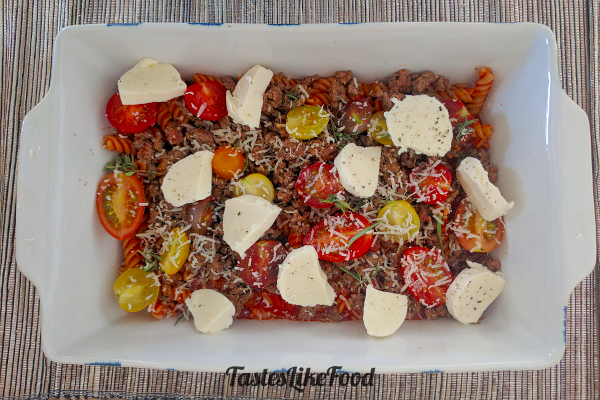 Spread the sliced tomatoes, Mozzarella, herbs and the remaining 3 Tbsp of Parmesan on the beef. Bake the casserole in the oven for 45 minutes. Afterwards, remove it from the oven and wait for 5 minutes before serving so that the pasta becomes crunchy and so that all the flavours combine. Garnish the casserole with fresh basil, 3-4 fresh cherry tomatoes and freshly ground black pepper.